"There is no business today of any scope, of any size, in a civilized society that can make false claims without being exposed to penalties"
Norway's Ministry of Finance announced January 30 that it would exclude mining giant Barrick Gold from the country's pension fund for ethical reasons. 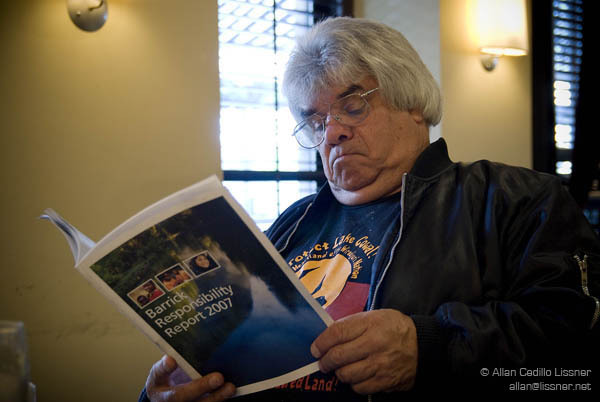 One week later, another victory against Barrick in Australia occurred when a judge ruled in favor of Wiradjuri Traditional Owner, Neville "Chappy" Williams, in granting an injunction restraining the proposed expansion of Barrick Gold's mine in Lake Cowal, New South Wales. More significant than the $200 million divested from Barrick, or the delay in Lake Cowal mine's expansion, is the context that these rulings expose: one of deliberate deceit on the part of Barrick Gold, now Canada's largest publicly-traded company. While the Norwegian Council of Ethics full recommendation mentions conflicts involving Barrick in Chile, Tanzania, and the Philippines, the panel acknowledged that, "due to limited resources," it restricted its investigation of Barrick to the Porgera mine in Papua New Guinea. The Porgera mine has been a prime target for criticism because Barrick dumps its mine waste directly into the river system, a practice banned in almost every country in the world. Barrick boasts in its Porgera Mine Responsibility Report that its "environmental specialists routinely monitor the land, air and water," claiming that environmental performance data tables are available on its website. However, Norway's Council on Ethics found – after multiple requests – that Barrick "does not publish any figures relating to the discharges from the Porgera mine and provides little information in general on the environmental aspects of the operation." Thus, relying on data from 1999, instead of discrediting Barrick's claims that it "follows a government-approved environmental management and monitoring program," the Council criticized the standards of that program and noted that there is only one compliance point –165 km downstream from the mine. The Council also found Barrick's claim that "there are no irreversible significant and adverse chemical impacts on this river system" was not credible, noting that "all surveys [that the Council] has had access to show an unambiguous trend of elevated heavy metal concentrations in the sediments." Barrick asserts that "health risk assessments and medical assessments of downriver populations have been conducted and interim reports are posted from time-to-time. [Barrick does] not believe that there is evidence of health risks to the downstream populations." Not only was the Council unable to find any scientific reports on human health since Barrick started to manage the mine. But, through it's own investigations of the mine site, the Council found that those living near the mine site were in direct contact with mine waste: through footpaths, gardens, alluvial mining, and water collection facilities. In addition, the Council noted that local residents themselves have "no access to information regarding the content of hazardous substances in the tailings, air emissions and air quality, or the quality of the drinking water." "Barrick's operation of the Porgera mine entails an unacceptable risk of extensive and irreversible damage to the natural environment… reinforced by the lack of openness and transparency in the company's environmental reporting," reads the Council's final report. "It's unbelievably embarrassing," admits Canada's Green Party deputy leader Adriane Carr. "It's got to be bad news for Canada when a foreign government says it's going to sell its shares in a Canadian company they figure is unethical." All the more embarrassing is that Barrick's chairman Peter Munk recently received the Order of Canada, Canada's highest civilian honor. Within a few weeks of Norway's announcement, the Porgera MP Phillip Kikala made calls to impose a state of emergency in Porgera, motivated by situation reports presented to him by Barrick (PNG) Limited. The National Executive Council has now made a call out for a combined defense force and police operation in Porgera including five mobile forces and one platoon at a cost of $12 million PNG Kina (~$4 million). According to ABC Australia, "Armed men have been holding up trucks carrying supplies for the mine and businesses in Porgera." But Jethro Tulin of Porgera Alliance, a coalition of landowners and human rights defenders, believes that the real lawlessness is the environmental and human rights abuses committed by Barrick Gold. In a press statement, he demands that the PNG government and Barrick "immediately start to address the catastrophic problem pro-actively rather than over reacting with high level security installations and branding it has a law and order problem. Calling a State of Emergency is not the right method to fix these extensive and irreversible damages, the ordinary people are already victims of what has gone wrong." A week following Norway's divestment, Barrick had another setback when the proposed expansion of their Lake Cowal mine was turned down in New South Wales' Land and Environment Court. Barrick spokesman Bill Shallvey said that the company would appeal against the decision, adding that the company had taken the appropriate avenues to seek approval to modify the gold mine. But history reveals a different story. This is the third injunction that Wiradjuri Elder Neville "Chappy" Williams has won against Barrick Gold. Before Barrick constructed the mine, Williams won an injunction on the grounds that the Wiradjuri relics were being damaged without any "Consent to Destroy." The latest injunction is a small victory in relation to the larger struggle for Native Title recognition in the Lake Cowal Area. Williams, who applied for this and previous injunctions, is also the spokesperson for the Mooka/Kalara United Families claim group, which represents over 3,000 Wiradjuri people. Since 2002, they have been fighting the New South Wales government over the native title to the Lake Cowal area, where Barrick is mining an ancient ephemeral lake and Wiradjuri sacred site. "Barrick negotiated in secret with five unauthorized Wiradjuri," Williams explained to a room full of shareholder's at Barrick's Annual General meeting last year. "Barrick claims a good record in negotiating with Wiradjuri, but this is not true and the main negotiator, Percy Knight, was on a suspended sentence for fraud when he signed the deal. Now, the entire Wiradjuri nation is supposedly bound to this agreement but no one else can see it, even though we have tried to get a copy under Freedom of Information." The group that Barrick had negotiated with, the "Wiradjuri Condobolin Native Title Claim Group" (later renamed "The Wiradjuri People") received an undisclosed amount of financial compensation for ceding their consent to mine the area. This gives all new meaning to Percy Knight's statement that "the Wiradjuri people and Barrick enjoy 'a mutually beneficial relationship'." Williams has made several attempts to get a copy of the ancillary deed and other documents like a full inventory of artefacts collected at Lake Cowal, but Barrick claims that the deed is "Commercial-in-Confidence." "The Wiradjuri People" have since discontinued their title claim to Lake Cowal, leaving Williams' group as the sole native title claimant to the Lake Cowal area. "They couldn't prove their connection to the land, so they just took the money and ran," explained Williams when asked about why "the Wiradjuri People" discontinued their land claim. "They claim to be Wiradjuri elders, but they signed a consent to destroy Aboriginal objects. How could they do that? They are really just sellouts who have signed away our ancient cultural heritage." Under duress, the Mooka and Kalara United Families group will present an anthropological report in March and make a case for their Native Title claim. The Federal court will give further directions on Title Claim case in May. If successful, there is still a worry that the traditional owners will be unable to stop Barrick's mine on their land, which was once used for ceremonies and is known as the "Sacred Heartland of the Wiradjuri Nation." According to Australia's Native Title Act, when conflicts arise over land use, traditional owners have no right to a veto, they can only negotiate on how to say yes. If the traditional owners refuse to say yes, the matter goes to arbitration and the government can override it in "the national interest." It is no wonder that the Native Title Act has been condemned by the United Nations multiple times as a bad and racist law. Even given these difficult circumstances, the group remains hopeful. "We have to fight for every inch that we get; we've been in the court for 10 years and are very pleased with the result of this court case," Williams admitted of the Mooka/Kalara group's long struggle to save the Lake Cowal area. "But we will fight to the bitter end to protect and preserve our ancient cultural heritage."